A few months ago, I saw an article (I think a Dr. Oz thing???) about how microwave popcorn is full of chemicals and is linked to lung cancer (something about there being added chemicals to make it smell good while popping) My son loves popcorn, so we have it frequently in our house, and hearing this kind of freaked me out. I had some regular non-microwave popcorn left over from Christmas gifts that I made for neighbors (vanilla glazed cranberry popcorn), so I switched to using the stove type. I love it. It takes just as long as microwave popcorn, and it’s a really cool thing that my son gets to help. He helps pour/spoon the oil and the kernels, and gets to watch everything pop (we use a deep pan that has a glass lid so we can watch). But it’s a little boring. For normal days, a little fine sea salt mixed in with the oil you’re using to pop is delicious. But sometimes I want more. And more is what I did when my son and I were having a sleepover last night. I don’t know where the idea came from, but I’m so glad it came to me. And, like everything I do, it’s super easy, but packs a big wow factor. Without further ado, here’s the “recipe” if you can even call it that. I didn’t put measurements, because it’s really up to you how much of everything to add. Pop your popcorn. Microwave is fine, but if you want to try the stove top type, I’ve added directions at the end of this post. Spread the popcorn out onto a sheet pan. Drizzle a little bit of the caramel sauce over the popcorn. Sprinkle chips, marshmallows and cereal over the popcorn. Add more caramel sauce. Sprinkle with salt if you’d like. It’s so easy. I put a little oil in a deep wide pan. I like to use vegetable or coconut oil (this is where I would add salt if I’m keeping my popcorn plain).I pour in enough kernels to almost cover the bottom of the pan. Then, I turn the burner on high and let it go. When it starts to pop, I shake it a few times. Just like microwave popcorn, you’ll hear/see the popping slow down. Take it off the heat, and you’re done. I like to move it to a different bowl or pan right away because it tends to scorch a little bit if you leave it in the hot pan. Ta-dah! You have fancy popcorn! 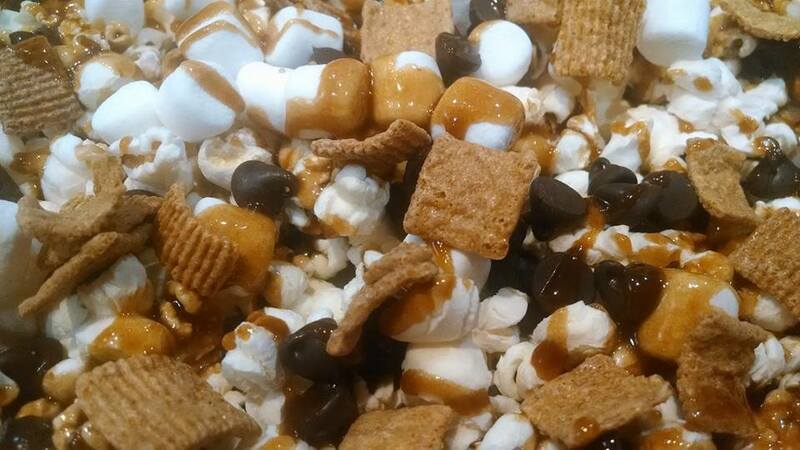 This entry was posted in recipes, sweet stuff and tagged caramel popcorn, fancy popcorn, popcorn, popcorn recipes, s'mores, s'mores popcorn, snack recipes, snacks on June 5, 2014 by aliciamariel.